Christmas has really locked down the green and red and sometimes even seen one color makes me think of the season. Case in point the recently released ad campaign for a jewelry brand unveiling it’s holiday trinket offering. 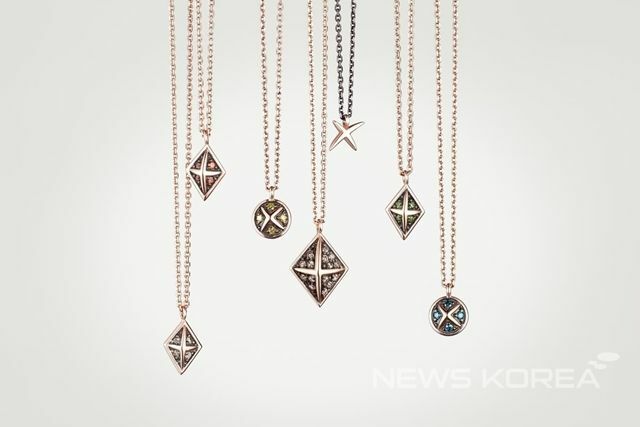 Actress-idol Suzy models the delicate rings and necklaces with shades of ornamental designs but without the heaviness. It’s been a relatively lackluster season for Suzy in terms of acting or singing hits, her movie The Sound of a Flower was a flop and drama Uncontrollably Fond was underwhelming. If she’s still coasting on the Architecture 101 affection then it’s certainly a long sailing ship but next year is looking promising with her doing K-drama While You Were Sleeping with Lee Jong Seok with a script by Park Hye Ryun. That last pic has some unintentional demonic eyes lol. @Gina it’s like she’s trying to give an intense stare and just ends up looking a weird cross between blank and demonic. She should stick to modelling, I really don’t think she has it in her to form a variety of facial expressions. But at least Park Hae Ryun will write her a character that’s blank so maybe she can manage that much. If it hadn’t been for the headline, I wouldn’t have recognized her! She just got a MAMA award with Baekhyun, tho. And is getting ready for a solo debut as a singer. She’s a much better singer than an actress that’s for sure, but she improved her singing greatly for the past few years. I recommend her Skinny Love cover on youtube. I still think @teacakes was right and she should stick to doing what she can do – singing and modelling – instead of what she can’t, or isn’t motivated to put in the work for on her own time (acting). She’s beautiful but her photoshoots have nothing to brag about. If it is true shame on the CEO of YG for making LYS act with her when there are who are much more suited for his talent. God, she is extremely pretty and a good singer. But she has near zero acting skills and yet they keep casting her. I won’t watch a LJS drama, thanks to her. her acting is good.. not bad..need more experience than do nothing.. she does the right thing for accept the role.. drama or film..she will learn from the experience.. fail or not from the drama not because of the actor but the story..
As long as she gets roles she would be an idiot to refuse them ! Popularity doesn’t last forever. And i don’t think that her acting is bad. IMO she’ s just average in what she does. That’s the thing though is that she DOES have experience acting in lead roles and she is NOT really learning. How long do we have to wait until she pulls off a good performance when there are so many other actresses that can already do it… If she was really sincere in her acting, she would take smaller roles within her capability and grow from there and learn from other seasoned actors. I think then she would truly be able to improve. Ask how long it takes to become a good at acting to any actor or actress and they will tell you ‘a life time’, everyone is always learning, quote “if you think you have known all there is to know then you are just a fool who didn’t look deeper.” Totally forgot who said that line but I think it’s very poignant. That’s the best thing about learning, there is never an end to it. @Tyn123 – I see “learning” is the new “improving” in the Suzy fan lexicon. She may be ‘learning’ plenty but it certainly isn’t reflected in her acting performances when even five years after her debut she’s struggling with basic acting skills like speech and facial expression/emotion. Even great actors have the humility to say they’re on a constant process of learning, but in the face of performances like Suzy’s, those are hollow words. Since it became clear that she’s not improving to lead role levels, her fans have started trying to shift the blame by saying the writer/directors are fully responsible for an actor’s performance. She had plenty of experience already and keeps being bad, how much more ‘experience’ is she supposed to get before getting better? time will answer your question.. how can you judge another people when you didn’t even really know actually about her. and i hope suzy will get more more experience from drama and film and music in the future and always keep wise in every action. Uh… so what brand jewelry is this?